I finally caught the cold that's had Greg, my husband, sneezing and sniffling for a week. I had hoped it was going to pass me by but, alas, I have succumbed. I took a quick walk through my neighborhood with Chloe, my dog, and then spent the rest of the day drinking peppermint tea and blowing my nose. Oh, and drawing. Lucky me! It was a great day at the bird feeder! 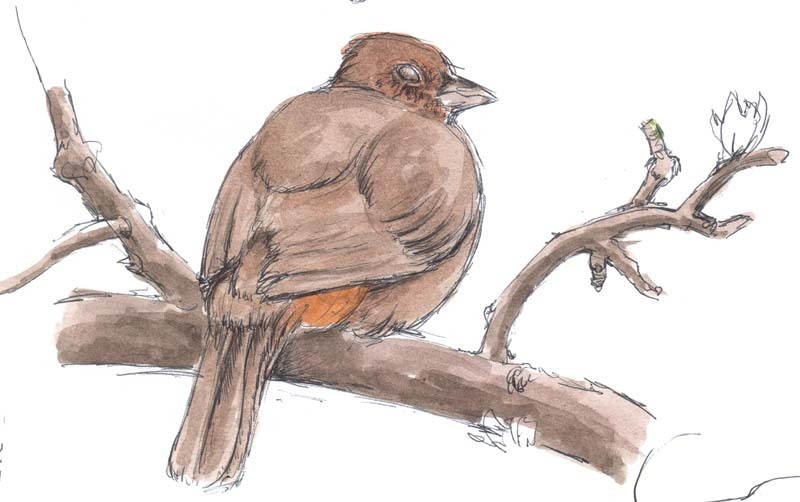 It was warm and sunny just before lunch so I sat on the front porch and sketched one of the California towhees (Pipilo crissalis) that seem to always be around the yard. This one has had an ominous lump on it's head for quite a while. Today, I saw it from the other side for the first time, and found that it's blind on that side. It sat quietly so I was able to spend more time watching and drawing. These birds are about as drab as a bird can be except for that fabulous orange patch under the tail. Although my sketch doesn't show it, there's a bit of orange on the head, too. Next: Woodpeckers at the seed feeder?! A storm was on it's way and the feeder gang was more diverse than usual. Maybe they were loading up, just in case? The geese at the top of the page were from Howarth Park earlier in the day. The rest appeared at my feeder between 4:30 and 5:30 p.m. The Hairy woodpecker (Picoides villosus)...oops! Make that Nuttall's woodpecker (Picoides nuttallii) was in constant motion, cruising along the top of our fence and pausing here and there to peck small holes in the wood. The chestnut chickadee came when everyone else had gone and was a stealth feeder like the oak titmouse. It would furtively fly to the feeder, grab a seed and furtively take off, presumably to eat the seed. In a few moments it would return and do it all over again. The Chickadee was a stealth feeder, landing on the platform feeder, looking about furtively, grabbing a seed and flying off to eat it, then returning to repeat the whole act again. Each evening, before dinner, I spend some time with the birds that visit our feeder. Okay, really what I do is try to be invisible, either in the kitchen at the window or on the front porch. The finches like me better in the house. If I dare to sit outside on the front porch they'll sit in the next-door neighbor's magnolia and chide me for interrupting their evening meal and social hour. The sparrows, towhees and mourning doves are less disturbed by my presence outdoors and will generally mill about as long as I stay quiet and don't make any sudden moves. 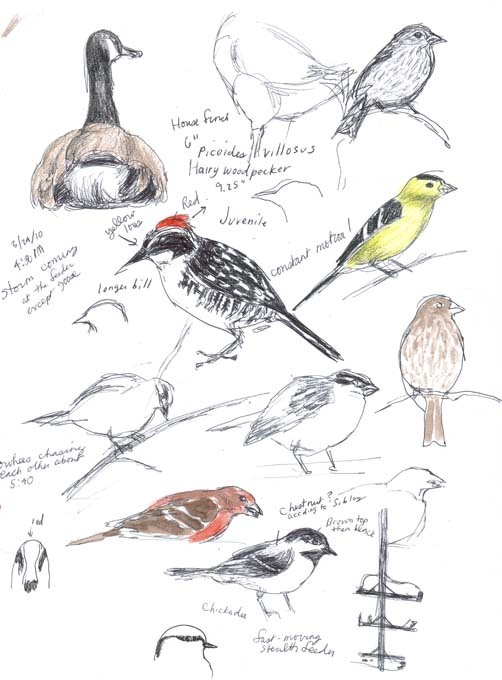 Sketching birds involves many interruptions and a lot of waiting. The feeder is in our front yard which is about the size of a postage stamp. Every time someone walks by, or a big, noisy truck drives by, or a kid on a skateboard zooms down the street, all of the birds scatter and I'm left waiting to see if they'll come back. 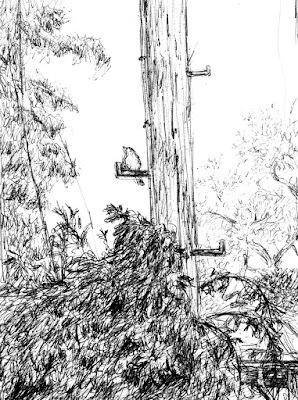 A few nights ago, while waiting for the finches to return I noticed a young white-crowned sparrow perched on one of the obsolete rungs on our telephone pole. The sun was already low enough that there were no shadows and the light was a bit orange. 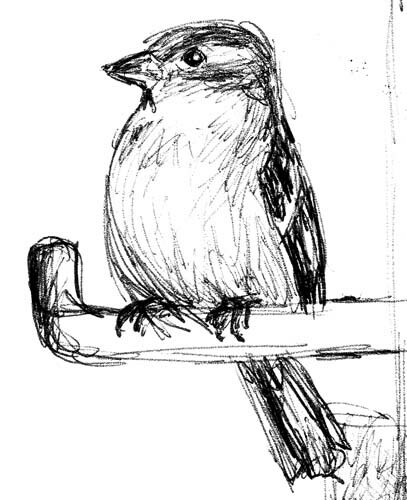 The sparrow stayed for what seemed like forever so I drew a couple of close-ups using my binoculars. 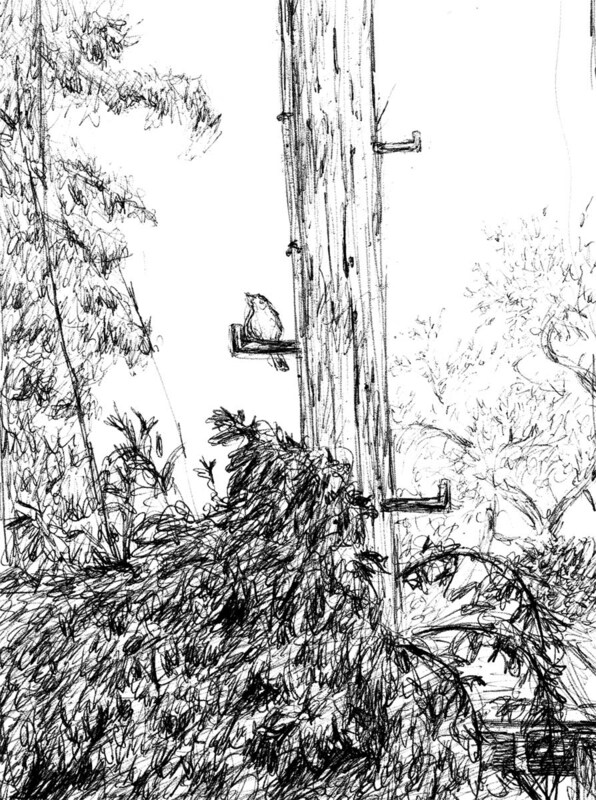 Then, when the bird had gone and the finches still hadn't returned, I sketched out the scene. I've noticed a Black-crowned night heron (Nycticorax nycticorax) hiding out in various spots around Lake Ralphine at Howarth Park and was looking for it today. Imagine my surprise and delight when I found three tucked into the cozy little cove at the end of the lake! In the middle of the day, no less! I'm not sure if this is a family. My notes state that both of the adults had yellow feet which indicates that they're not pair-bonded. According to oiseaux-birds.com this heron's feet turn pinkish when they've mated. On the other hand, both adults had long white plume feathers coming out of their napes which is a part of breeding plumage. Perhaps, as the season progresses, I'll be able to learn more about the relationship between the three birds. 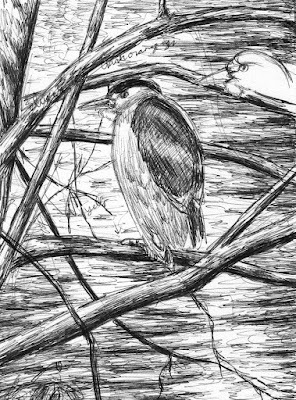 Black-crowned night herons nest in colonies, often with other birds. 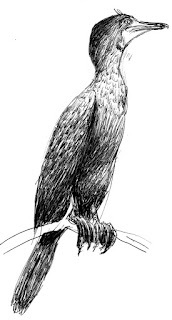 In Santa Rosa, CA, where I live, there's a rookery on the other side of town with Black-crowned night herons, Great egrets, Cattle egrets and snowy egrets. 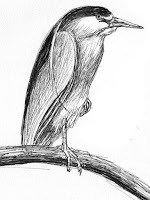 Black-crowned night herons are quite common everywhere but the tips of the earth and the area around Australia, New Zealand and New Guinea. It was unseasonably warm a few days ago as I walked around Lake Ralphine at Howarth Park. At the far end of the park where it's shallow and a bit secluded, I saw what I thought was a protruding rock poking up above the puffs of algae. 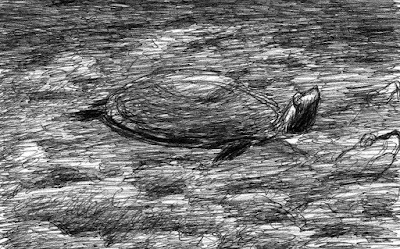 A bit of movement made me realize that it was a turtle, drifting on the nearly non-existent current and basking in the sun. It may be a Painted Turtle but I wasn't able to see any more than some stripes on it's chin, so I'm not sure. One of the things that I love about sketching is that it makes me look so hard and long at ordinary things that they cease to be ordinary. And, because people who don't live in North America see my work online, I've also been made to remember that what's ordinary to me is extraordinary to someone on another continent! 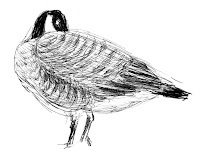 Take, for example, Canada geese (Branta canadensis). Long before I started learning the names of birds I encountered, I was familiar with these large migratory birds. I grew up in cities on the Great Lakes. As the geese headed back north to breed, their wild honking, as they flew over our house on cold gray days, was the sound of spring arriving. 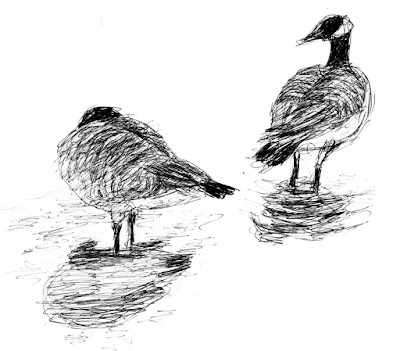 Toward the end of every winter, a part of me listened for the geese and when I heard them, no matter what time it was, I ran outside or opened the nearest window to watch them fly by. I live in northern California now and winter isn't as hard or long here as it was back east. Canadas still fly over in the autumn and the spring, although not in anything like the numbers that fly over the Great Lakes, and I've seen some spectacular group landings on Lake Ralphine at Howarth Park, as the wild birds stop to visit during their migration. 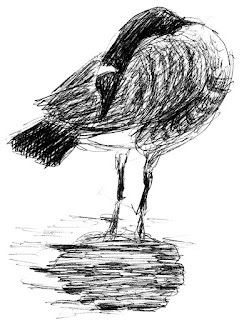 As in other areas on the continent, many Canada geese have chosen not to migrate. Plentiful food and a lack of natural predators has made it easier to stay than to go. There's a group that lives year round at Howarth Park. Along with a good supply of the grasses and aquatic plants that they naturally feed on, these geese eat bread and other goodies brought by park visitors. As a result, they're very tame and that makes them excellent models for sketching. Unlike their wild relatives, they'll mostly ignore my dog and I when we plunk ourselves down on a rock near the shore, as long as we keep some distance between us and them. These birds were so close that I didn't have to use my binoculars to draw them or to appreciate their beauty and grace. 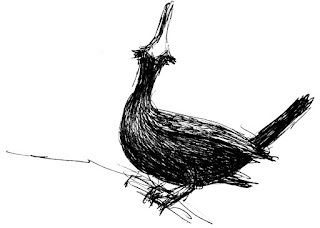 Howarth Park is home to a small colony of double-crested cormorants (Phalacrocorax auritus). They can be found fishing in Lake Ralphine and roosting in a couple of trees near the parking area. 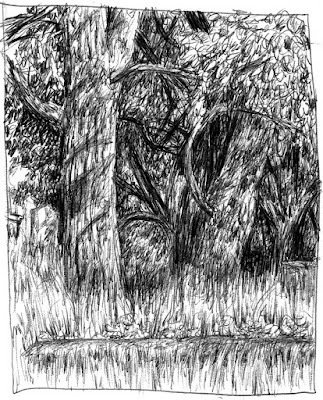 I found a small rise across from one of the trees and watched and sketched cormorants while Chloe paid close attention to a California ground squirrel den nearby. A young bird, recognizable by the lighter feathers on it’s breast and shoulders and all yellow beak, sat quite still on an upper branch with it’s neck vibrating soundlessly. Every now and then it would open it’s beak and continue to vibrate then close it back up while still vibrating. landed on a branch next to one of the birds I’d been sketching, a bird with black crests. Black crest was making the strange sound and striking some rather suggestive poses, then the two birds began to dance about very clumsily on the rather flimsy branch. White crest moved closer and black crest sang louder. Much neck rubbing and head bobbing ensued and white crest flew off, only to return a few minutes later and they both danced a bit more until white crest again flew off. Not long after I saw white crest swimming on the lake in the company of several black-crested cormorants. On land cormorants are awkward and slow-moving but underwater they are apparently fast and graceful. Unlike other water birds their feathers aren’t waterproof. As a consequence, once the bird is out of the water, you’ll often see them perched in trees with their wings spread wide to dry out. 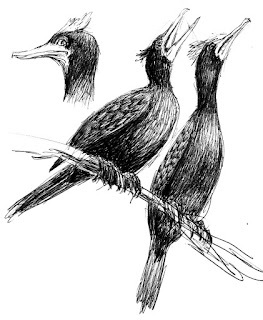 Before DDT was banned in 1972, and PCB’s in 1976, the numbers of double-crested cormorants were profoundly diminished. Today, they’re so numerous and easily found that they’re considered a pest by many humans, especially those who fish. Great Lakes Fact Sheet: The Rise of the Double-crested Cormorant on the Great Lakes: Winning the War Against Contaminants. It was a bad day and I was in a bad mood. The day was drawing to a close and I thought a trip to Santa Rosa Rural Cemetery might help me snap out of it. I hoped I might be able to draw something, anything, and transport myself into that lovely place I go to when I draw and am able to let go of everything else. At the end of an hour that passed all too quickly my mood had lightened and the day didn't seem quite as bad. Sometimes I forget what an amazing gift it is to be able to pick up a ballpoint pen and some paper and travel...outside of myself. It was good to be reminded. Lately, I've noticed a new crop of earth tongues fruiting in the woods at Howarth Park. They're quite a bit larger than those I saw in February and their caps are magnificently distorted. They seem to be very happy Trichoglossum hirsutum. Their velvety stems are covered with fine hairs that you can only see under magnification---well, maybe you could see them without, but I can't. They're deep, deep black in color and I get a thrill every time I see one. Or two. They're usually the last of the fungi before spring arrives in earnest. I'm going to miss seeing mushrooms and earth tongues, but wildflowers are blooming and trees are leafing out. Ground squirrels are sitting on rocks with their faces pointed at the sun. I've heard and seen several hummingbirds swoop straight out of the sky with a sharp popping sound, while wooing their potential mates. The grass is tall and growing taller each day. There are so many ticks waiting in that tall grass that Chloe and I are sticking more to the trails. It's really spring! I find myself happy to wear fewer layers of clothing when I go out walking. 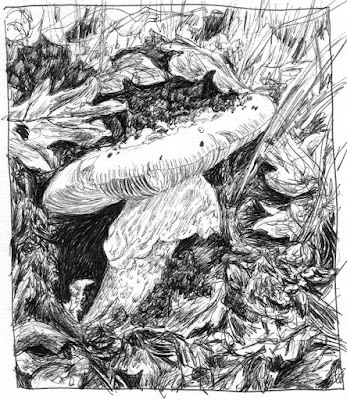 Today my fingers were warm while I drew and the sun beat down warm enough to keep Chloe comfortable, for a change, while I drew the last fungi of the season. I think I could get used to this, at least for a while. Yet another member of the Helvella family, this one is called Helvella acetabulum. I've been on the lookout for these at Howarth Park for a few weeks, having completely forgotten that they fruit in every corner, it seems, at Santa Rosa Rural Cemetery. 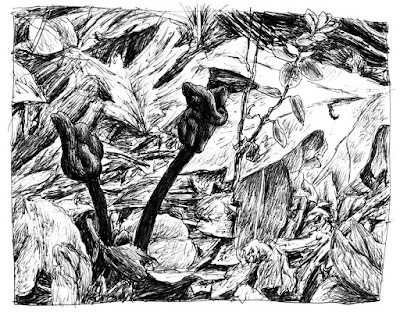 There was a breeze blowing, causing puffs of spores to fly up, up and away as I sketched. Normally the "ribs" are lighter than the "cup" but I caught this one with the sun shining into it. 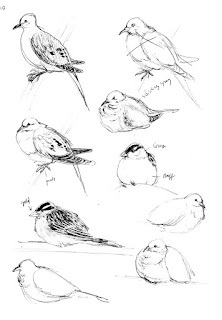 I've noticed that Mourning Doves (Zenaida macroura) and White-crowned sparrows (Zonotrichia leucophrys) are extremely tolerant of humans nearby, much more so than the very nervous House finches (Carpodacus mexicanus). It had rained all day and I wanted to be outside. 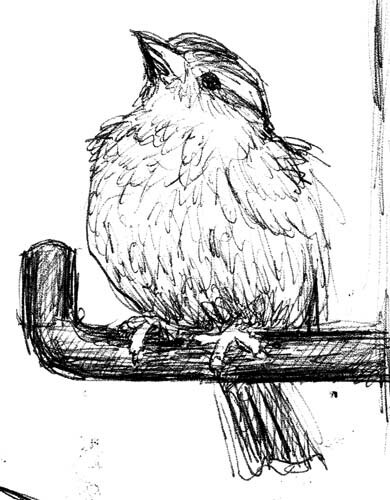 Several birds were lounging in the front yard so I sat on the porch with Chloe and my sketchbook. We all congregated peaceably for about forty-five minutes. House finches flurried about the feeder, eyeing Chloe and I nervously, but the sparrows and doves just rested and watched me watching them. It's been too wet to go out and draw lately. I promised some people, a long time ago, a picture of the gear I take out with me when I walk and finally drew it the past couple of days. Check out the annotated version at flickr. You might remember Coccora from an earlier post this year. 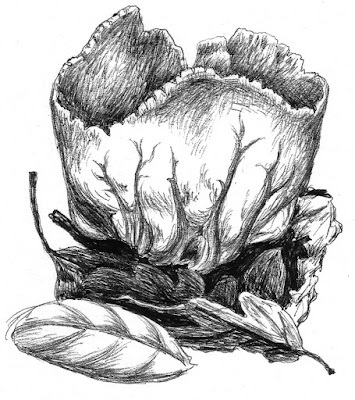 This edible mushroom fruits in the fall and again in the spring, although the spring version has a pale golden cap rather than the tawny cap of the fall Coccora. Both are Amanita calyptroderma, although there doesn't seem to be complete agreement on the latin name. You might also see it called Amanita lanei. This year, the spring coccoras are popping up all over Howarth Park. They seem to prefer shaded grassland, although I've seen some stunted specimens in a deeply wooded area. These sturdy mushrooms emerge from the earth like bulldozers, leaving dirt piled on top of the cap and off to the side. If you push aside some of the dirt you'll be able to see the delicate, skirt-like annulus. Dig a bit deeper to see the bottom portion of the universal veil that once enclosed the immature mushroom. On Coccora, you'll usually find a large, cottony patch of the universal veil on top of the mushroom cap, as well.